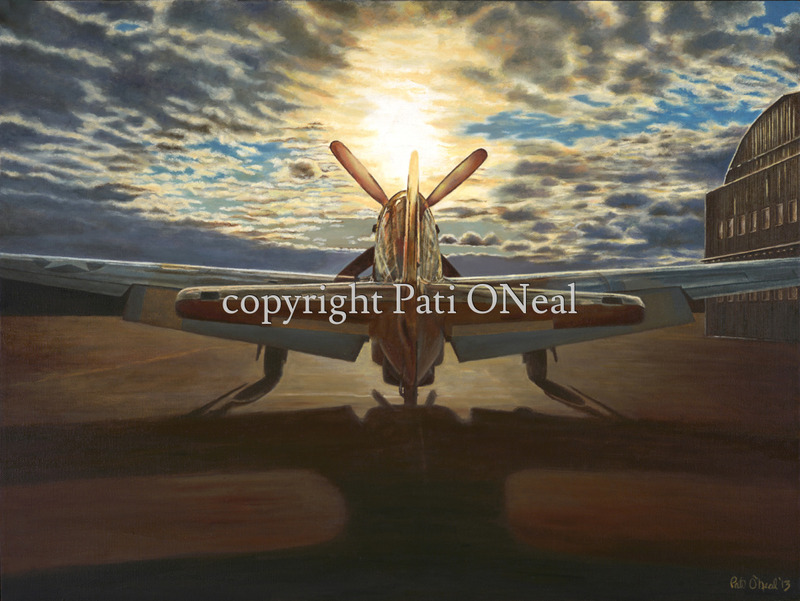 In this painting, Red Tail P-51C “Tuskegee Airmen” sits on the ramp facing west into the setting sun in tribute to all those that have “Gone West”. The phrase “Gone West” has been embraced by the aviation community in the belief of primitive times that the blessed went off to islands in the sunset when they passed their time on earth. The term gained popularity as a euphemism for death during World War I when wounded or dead Allied soldiers were sent west on their way home, along with the thought of the sun setting at the end of a perilous day. This painting was accepted in the juried 2013 ASAA International Aerospace Art Exhibition in Baltimore, MD and was displayed in the BWI Thurgood Marshall Airport, international terminal. Contact artist for purchase or for a similar commission. Limited edition giclées and open edition matted mini-prints also available.